London: Weidenfeld and Nicolson, 1980. Cloth. Very Good/Very Good +. 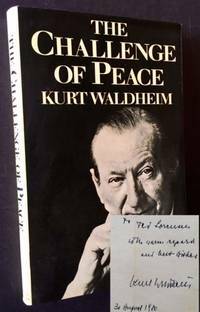 INSCRIBED BY KURT WALDHEIM TO JFK COUNSELOR, SPEECHWRITER, ADVISOR AND CONFIDANTE TED SORENSEN on the front free endpaper. A tight copy to boot of the 1980 1st English language edition. Solid and VG (light offsetting to the pastedowns and endsheets, light foxing along the edges) in a crisp, price-intact, VG+ dustjacket, with mild foxing --and a bit of creasing-- at the flap-folds. Octavo, light pencil underlining (no doubt Ted Sorensen's) intermittently thru the text. Preface by Brian Urquhart. Waldheim's take --as Secretary-General of the United Nations-- on its current (and potential) roles on the global stage. Cuba: Los Talleres del I.N.R.A. por el Departamento de Instruccion del MINFAR, 1960. Ejercito Rebelde Hernando Lopez. 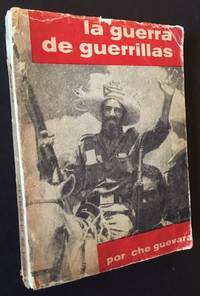 The 1960 true 1st edition of this fragile, cheaply-produced paperback, which represented the original publication of Che Guevara's inspiring treatise on how to battle and vanquish the imperial enemy, "La Guerra de Guerrillas". 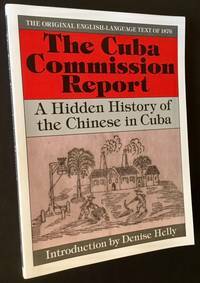 Pocket-sized, 64mo in its pictorial wrappers (showing a triumphant Fidel Castro on horse). Solid and VG, with very light creasing and wear along the panel edges and 1" of loss at the spine crown. One of the 20th century's highspots in Revolutionary literature, inspiring millions in Cuba abd thruout Latin America. Durham, NC: Duke University Press, 1983. Cloth. Near Fine/Very Good +. A tight, very solid copy of the 1983 1st edition. Clean and Near Fine in a crisp, Near Fine dustjacket. Octavo, 455 pgs. Part of the "Duke Monographs in Medieval and Renaissance Studies" series. Cambridge University Press, 1975. Cloth. Near Fine/Near Fine. A crisp, very sharp copy of the 1975 stated 3rd edition. Vol. II, Part 2 ("The Middle East and the Aegean Region c. 1380-1000 B.C.") in the remarkable "Cambridge Ancient History" series. Tight and Near Fine in a bright, price-clipped, Near Fine dustjacket. Thick octavo, 1,128 pgs., including a number of fold-out maps. Cambridge University Press, 1954. Cloth. Fine/Very Good. 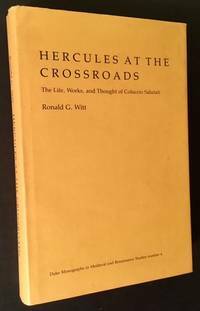 A very solid copy of the 1954 1st edition, 3rd impression ("reprinted, with corrections") of Vol. 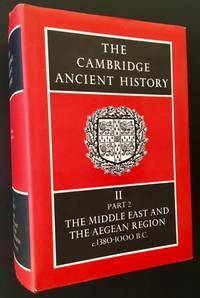 III ("The Assyrian Empire") of the Cambridge Ancient History. Tight and Fine in a crisp, price-intact (and price-clipped), VG dustjacket, with very light chipping at the spine crown and one small closed tear along the rear panel's top-edge. Thick octavo, top-edge gilt, 821 pgs. Fold-out maps thruout the text and at the rear. Cambridge University Press, 1962. Cloth. Fine/Near Fine. 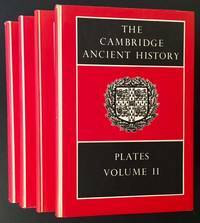 4 separate plate books, each accompanying its corresponding volume in the legendary Cambridge Ancient History set. Included here are the plates to Vols. II, III, IV and V. Each is tight and Near Fine to Fine (light offsetting at the endpapers of Vol. II) in bright, price-intact (and price-clipped), Near Fine dustjackets. All of the plate books are 2nd impressions, each published in 1960 or 1962. Uniform octavos, top-edges gilt, hundreds and hundreds of crisp black-and-white plates thruout. Cambridge Ancient History, 1953. Cloth. Near Fine/Near Fine. A lovely copy of the 1953 1st edition, 4th impression ("reprinted, with slight corrections") of Vol. IV ("The Persan Empire and the West") of the Cambridge Ancient History. Tight and Near Fine in a crisp, price-intact (and price-clipped), Near Fine dustjacket, with very light chipping at the spine crown and one small closed tear along the rear panel's top-edge. Thick octavo, top-edge gilt, 698 pgs. Fold-out maps thruout the text and at the rear. Cambridge University Press, 1952. Cloth. Near Fine/Very Good +. A tight, well-preserved copy of the 1952 1st edition, 2nd impression ("reprinted with corrections"). Clean and Near Fine in a crisp, price-intact, VG+ dustjacket, with very light chipping along the spine crown and at the tips. Thick octvavo, top-edge gilt, 1,058 pgs. Fold-out maps thruout the text and at the rear. Cambridge University Press, 1954. Cloth. Fine/Near Fine. A clean, very sharp copy of the 1954 1st edition, 2nd impression ("reprinted, with corrections") of Vol. 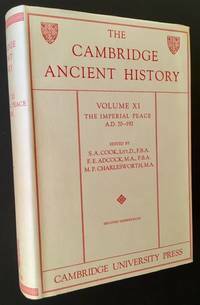 XI ("The Imperial Peace A.D. 70-192") of the Cambridge Ancient History. Tight and Fine in a crisp, price-intact (and price-clipped), Near Fine dustjacket, with very minor creasing along the rear panel. Thick octavo, top-edge gilt, 997 pgs. Fold-out maps thruout the text and at the rear. 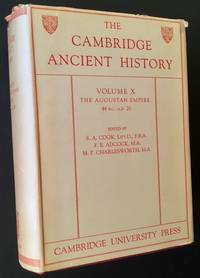 The Cambridge Ancient History: Volume VI -- Macedon 401-301 B.C. Cambrisge University Press, 1953. Cloth. Near Fine/Near Fine. A very impressive copy of the 1953 1st edition, 3rd impression ("reprinted with corrections") of Vol. VI (Macedon 401-301 B.C.) of the Cambridge Ancient History. Clean and Near Fine to Fine in a crisp, price-clipped, Near Fine example of the wonderful cream-colored dustjacket. Octavo, top-edge gilt, 646 pgs. plus a number of fold-out maps thruout the text and at the rear. 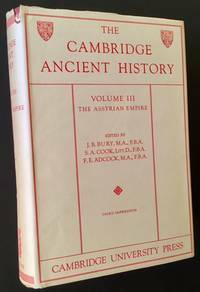 The Cambridge Ancient History: Volume IX -- The Roman Republic 133-44 B.C. 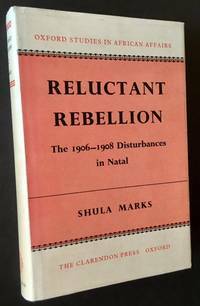 Cambridge University Press, 1951. Cloth. Near Fine/Near Fine. A very attractive copy of the 1951 1st edition, 2nd impression ("reprinted, with slight corrections") of Vol. IX ("The Roman Republic 133-44 B.C.) 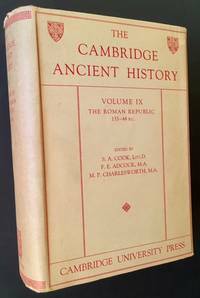 of the Cambridge Ancient History. Clean and Near Fine (one small bump to the front panel's upper tip) in a crisp, price-intact, Near Fine dustjacket, with light bumping to the front upper tip and just a touch of faint chipping at the spine crown. Thick octavo, top-edge gilt, 1,023 pgs. Fold-out maps thruout the text and at the rear. Cambridge University Press, 1954. Cloth. Fine/Very Good. A tight, well-preserved copy of the 1954 1st edition, 2nd impression ("reprinted with corrections") of Vol. 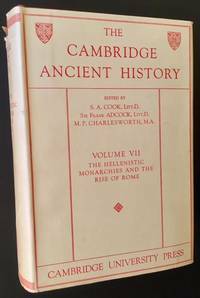 VII ("The Hellenistic Monarchies and the Rise of Rome") of the Cambridge Ancient History, Clean and Fine (with pristine gilt-insignia and titling along the front panel and spine) in a crisp, price-intact (and price-clipped), VG dustjacket, with a chip (about the size of a quarter) along the spine crown. Thick octavo, top-edge gilt, 987 pgs. Fold-out maps thruout the text and at the rear. London: Oxford University Press, 1970. Cloth. Very Good +/Very Good +. A very solid copy of the 1970 1st edition. Tight and VG+ (discreet, occasional underlining at several spots) in a crisp, price-clipped, VG+ dustjacket. 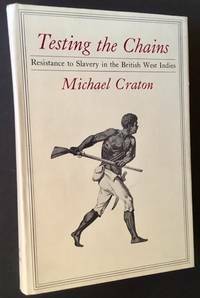 Octavo, part of the formidable "Oxford Studies in African Affairs" series. Ithaca, NY: Cornell University Press, 1982. Cloth. Near Fine/Near Fine. A crisp, very sharp copy of the 1982 1st edition, in its much less common hardback. Tight and Near Fine (very small former owner name at the front free endpaper) in a bright, Near Fine dustjacket. Octavo, 389 pgs., maps and engraved plates thruout. Baltimore: The Johns Hopkins University Press, 1993. Original wraps. Fine. A pristine copy of the 1993 1st thus, a facsimile re-issue of the original English language text of 1876. Tight and Fine in its pictorial wrappers, with no writing or markings of any kind internally. Quarto, 156 pgs. plus Appendix (Labor Contract, 1866, and Letter of Domicile, 1869). London: Oxford University Press, 1968. Cloth. Near Fine/Very Good. 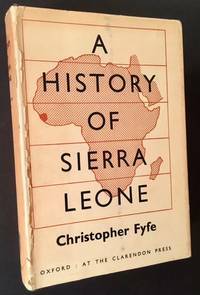 A very solid copy of this early, 1968 re-issue of Christopher Fyfe's exhaustive history of Sierra Leone. Tight and Near Fine (with no writing or markings of any kind internally) in a crisp, price-clipped, VG dustjacket, with light wear along the hinges and several very small closed tears at the panel edges. Thick octavo, 773 pgs., 2 fold-out maps at the rear. 1965. Near Fine. 1965 1 pg. 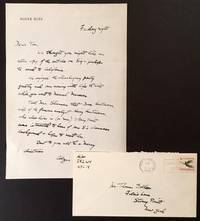 handwritten letter by Alger Hiss to the son of Cipe Pineles, pioneering female graphic designer of the 50s and 60s (who at different stages was the art director at "Mademoiselle", Charm" and "Seventeen"). Hiss writes very warmly to the young man, professing how much he had enjoyed Thanksgiving together with the young man's family. The letter measures 7 1/2" x 10 1/2" and is in crisp, very nice condition. 2 subtle folds and just a touch of creasing along the top-edge, otherwsise nearing pristine. Also includes the original envelope, addressed in Hiss's hand. London: Martin Hopkinson Ltd, 1932. Cloth. Near Fine/Near Fine. 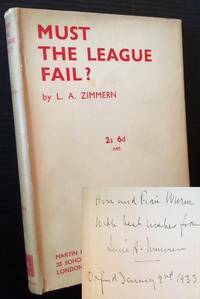 INSCRIBED BY THE AUTHOR L.A. ZIMMERN on the front free endpaper. A very solid copy to boot of the 1932 1st edition. Clean and Near Fine in a crisp, VG+ to Near Fine dustjacket, with mild darkening along the spine. 12mo, 96 pgs. New York: The Knickerbocker Press, 1906. Cloth. Very Good -. 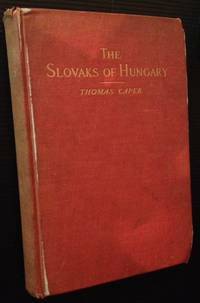 The 1906 1st edition, in its red cloth, with bright gilt-lettering to the front panel and spine. Solid and VG-, with light soiling to the boards, light wear along the spine crown and a very thin strip of paint at the front outer hinge. Former owner inscription as well at the front free endpaper along with a "Compliments of the National Slavonic Society of the United States of America" stamp. Ocatvo, 214 pgs. London: Henry Colburn, New Burlington Street, 1825. Full leather. Very Good +. A handsome 1st edition of Samuel Pepys' famous diary, which remains one of the great sources for the study of Restoration England. Complete in 2 thick quarto volumes, with 12 engraved plates, including a folding map. Bound in a gilt-edged full leather (dark-brown calf), with ornate gilt-titling and tooling at the compartments. Boards lightly rubbed at edges and corners, very light foxing --and just a bit of offsetting opposite the plates-- thruout the text. Both volumes tight, well-preserved and solidly VG+. This seminal diary, which Pepys wrote from 1660 to 1669, presents a fascinating picture of the official and upper-class life in Restoration London, with vivid, honest accounts of ordinary as well as great events, including the Plague and the Great Fire of London. The diary went unprinted for more than 150 years after its original composition because of its coded shorthand. For 3 years, the Rev. John Smith painstakingly deciphered the diary, all the while unaware that Pepys had taken his code from Thomas Shelton's "Tutor to Tachygraphy" (1642), which sat only a few shelves above the diary in Pepys' library. "It is a document of extraordinary interest, on account both of the light that its sincere narrative throws on the author's own lovable character, and of the vivid picture that it gives of everyday contemporary life, of the administration of the navy, and of the ways of the court". OCEL. NCBEL II:1583. GROLIER ENGLISH HUNDRED 75.